What makes more basic sense—or has a longer tradition—than a raw cultured vegetable diet? This ancient way of eating has caught the attention of foodies, fans of the slow-food movement, and the health-conscious for its power to convert raw vegetables into cancer-fighting superfoods. Raw cultured vegetables are a self-rejuvenating source of non-dairy lactobacilli, including acidophilus and lactobacillus plantarum, important for the maintenance of healthy intestinal flora and the alleviation of digestive disorders. The Complete Guide to Raw Cultured Vegetables, based on both scientific studies and the author’s extensive research, provides a fascinating introduction to this nourishing and nurturing food tradition. Included are clear explanations how to culture vegetables, delicious recipes, and suggestions on how to incorporate this approach into an optimum nutrition diet. The book also explores the role of raw cultured vegetables through human history, and why it is now surging in popularity. Increased vitality, happiness, and peace of mind go hand in hand with this diet, says the author, in tandem with harmonious digestion, glowing skin, and optimum brain functioning. The Complete Guide to Raw Cultured Vegetables includes a bonus array of concepts for peace and offers a simple, natural antidote to today’s overprocessed foods and hectic, unhealthy lifestyles. Introduction I have worked with raw cultured vegetables since 1980 when I founded Rejuvenative Foods. These past decades have seen an explosion in the awareness of the importance of minimally processed, organically produced foods for our physical, mental—even spiritual—health and well-being. In particular, people have really come to value the great benefits of a diet rich in raw or living foods. Why eat raw cultured vegetables? Like any other living thing, the human body functions and metabolizes thanks to enzymes and enzymatic actions. That’s why it’s so beneficial to feed your body enzyme-rich foods, like raw cultured vegetables. This is especially true when organs have been overused, producing enzymes to process overwhelming amounts of bulky, refined foods that take away digestive juices and give little or nothing back to the body. Nature designed the enzyme-making processes to be used for the purpose of normal metabolism—the rejuvenation of cells, the elimination of toxins, and the growing and strengthening of the immune system—with the minimum amount of enzyme production required for digestion. This makes sense when we consider that when nature designed the human body, there were no refined or processed foods, and a minimum of cooked foods, but raw and live foods full of enzymes were plentiful. It’s profoundly beneficial to eat enzyme-rich raw cultured vegetables to give your body a chance to make enzymes to rejuvenate itself instead of wasting a large portion of those enzymes and enzyme-making abilities digesting food. Most people are more commonly aware of cultured dairy products, including yoghurt and kefir, as a means to restore healthy microflora to their system. Doctors often recommend yogurt to reimplant lactobacilli after taking antibiotics. But according to the National Institutes of Health, some thirty million Americans will develop lactose intolerance by the age of twenty (NIH, 2006), so raw cultured vegetables present an important alternative for those who experience adverse effects to dairy. Whether or not you have a lactose intolerance or other dairy allergies, you will find that raw cultured vegetables provide you with crucial enzymes free of any feelings of heaviness that usually accompany dairy consumption. By eating raw cultured vegetables and experiencing how they affect our feeling of vibrancy and well-being, we can test out their physiological health benefits. We can experience the vibrancy of raw cultured vegetables just by their smell and the zingy taste. You can buy raw cultured vegetables, which include sauerkraut and kimchi, and use them with the recipes in this book, or make your own (instructions also included here). The possibilities are as varied as the wide world of vegetables and your imagination. Whether you eat raw cultured vegetables by themselves or in combination with other foods, you’ll experience their wonderful health benefits. Eating raw cultured vegetables at the same time as other foods, putting a little on the same fork or spoon, is particularly beneficial for a couple of reasons. First, this means you’re eating cultured vegetables more regularly and making them a part of your life and eating habits. Second, the probiotic process occurs more effectively as you’re chewing the cultured vegetables (which have naturally present lactobacilli and enzymes) with your starches and proteins. By paying attention to the food we eat and the processes involved in bringing our vegetables to the table and into our bodies, we have as a society become increasingly aware of the social, political, and personal benefits of prioritizing consumption of fresh, pure, whole foods. On the individual level, people can experience the soothing, empowering, healing benefits and resulting peace that come through eating vibrantly alive and delicious raw cultured vegetables. 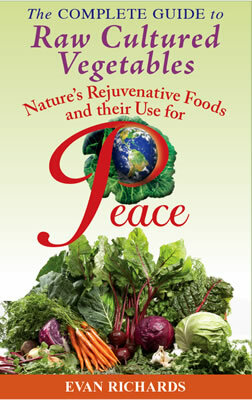 This book is timely because of three major issues: raw cultured vegetables are in demand more and more in conjunction with discoveries in nutritional research; peace is in demand more and more in conjunction with current world events; and personal health is also in increasing demand as evidenced by the proliferation of organic food in the natural food industry. So in writing a book about raw cultured vegetables I feel it is appropriate to convey ideas relating to peace that are beneficial, valuable, and/or underutilized. If you mainly want information on raw cultured vegetables, feel free to read only Parts 1 and 2. You can read about how eating more raw cultured vegetables can enhance your body’s metabolic functions, look up recipes for creating your own raw cultured vegetables, or understand different aspects of vegetable fermentation in addition to dairy fermentation, among other things. Parts 3 and 4 are about enhancing peace at all levels, from mind/body health to the deeper spiritual and ecological implications of how we live. Part 3 offers details of pragmatic solutions for daily living, including nutritional concerns and alternative medicine, which have been valuable to me. It has become my job to impart these ideas, methods, and goals, the most important of which is expanding an awareness of how we create peace through living more compassionate, integrated lives.This is an opportunity for people to experience how raw cultured vegetables can contribute not just to their health, but to domestic, community, national, and world peace. Because it is my goal for this book to benefit as diverse a range of people as possible, I’ve included a wide array of concepts for peace. You may disagree with and disregard some concepts contained within the book, which is fine. Embrace whatever ideas speak most strongly to you. Raw Cultured Vegetables for Life Enhancement Eating raw cultured vegetables enhances life. A simple explanation is that our bodies’ micro-ecological balance is enhanced by the consumption of raw cultured vegetables. A non-disputed, scientifically substantiated phenomenon is that raw cultured vegetables in their natural occurrence and creation will progress through a microbiological sequence that parallels that of the human digestive process. In other words, when vegetables are culturing, or experience lacto-fermentation, the naturally present lactobacilli in the fresh vegetables converts sugars and starches into lactic and acetic acids—a similar process to human digestion. So raw cultured vegetables, as they are being created, stored, eaten and swallowed, are performing and supporting functional metabolic processes. By eating raw cultured vegetables and experiencing how they affect our feeling of vibrancy and wellbeing, we can test out these physiological health benefits. Further understanding of raw cultured vegetables’ propensity to enhance life may be apparent from the way that one may experience the vibrancy of raw cultured vegetables by their smell and the zingy taste. Whether you eat raw cultured vegetables by themselves or in combination with other foods, you’re going to get some wonderful health benefits. But eating some raw cultured vegetables at the same time as other foods, putting a little on the same fork or spoon can bring some special benefits. First, this means you’re eating cultured vegetables more regularly and making them a part of your life and food consumption habits. Second, it’s easy to imagine the probiotic process occurring more effectively as you’re chewing the enzymes and cultured vegetables (which have the naturally present lactobacilli and enzymes) with your starches and proteins.